Today, for lunch, I cooked a dish inspired by a traditional Icelandic recipe, paired with a very Croatian side dish: fiskibollur, meet blitva, blitva, meet fiskibollur! My first experience as an expat was in Iceland. As I lived in Reykjavik, I tried to learn the language, I made friends and I also discovered the Icelandic culinary culture. Once, as the guest of honor at a dinner, I was served a whole sheep’s head, complete with eyes and teeth! Like Croats, Icelanders love their lamb, but in my opinion, the best ingredient you can find there is fish: there’s plenty of it, it is available in many different sorts and it is always, always fresh. 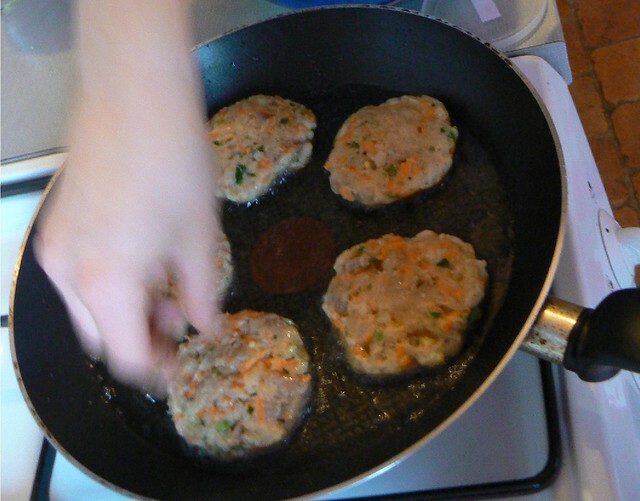 Icelanders know many different ways to cook fish, one of my favorite being fiskibollur, or fish patties. It is a very common, everyday food, the type of dish for which each home has its own recipe. I think the one I have comes from my landlady in Reykjavik. The traditional recipe uses milk, but I seldom have it in the fridge, so I tweaked the proportion a little bit to get the right texture, not too dry, no too moist, so that it doesn’t fall apart during the frying. The result is not quite like the original fiskibollur, which is closer to a pancake in texture, but it was really delicious – and well worth the smell of oil lingering in my kitchen! Fiskibollur are usually made with Northern Atlantic fish such as haddock, pollock or cod, but I guess you could substitute any white fish with a firm flesh or use the frozen cod available in every supermarket. 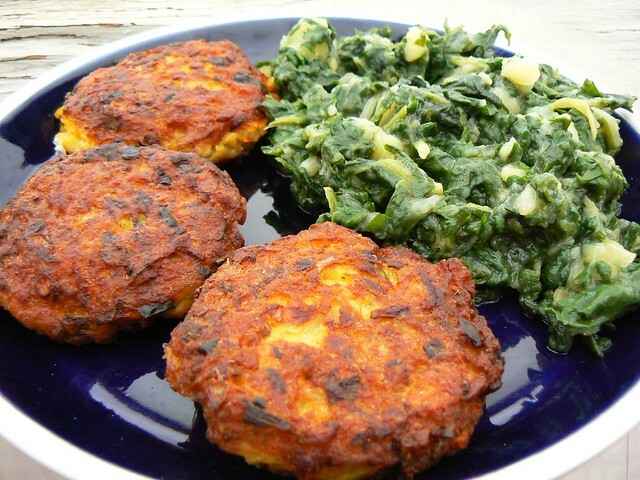 They are traditionally served with boiled potatoes, a melted butter and lemon sauce, and a green salad on the side. However, today I paired it with the side dish that is most commonly served with fish in Croatia, boiled blitva or chard with potatoes, garlic and olive oil, and it worked really well! Chop the fish and the spring onion finely, and grate the carrot (you can use a food processor). Combine them, and add salt and pepper. You can add chopped garlic and herbs if you feel like it. Beat the egg and add it to the mixture, then add the flour. Mix well and set aside in the fridge for about 20 minutes. Form small balls with the mixture and flatten them into patties (about 5 cm in diameter). you can put flour on your hands if it is too sticky. Fry them until golden brown and cooked through, about 7 to 8 minutes on each side. Serve immediately with a wedge of lemon.